When I told my friends and family I was going to Canada, they invariably assumed I meant the west coast. Ontario just wasn’t on their radar. “So it’s got Niagara, but why else would you go?” they asked. A good question, and one that I admittedly struggled to answer before my trip. But having now returned from the state, captivated by its charms, I’m ready to answer. So here goes: my top 10 reasons to visit Ontario. In my opinion, Ontario’s 250,000 lakes are its greatest attraction. 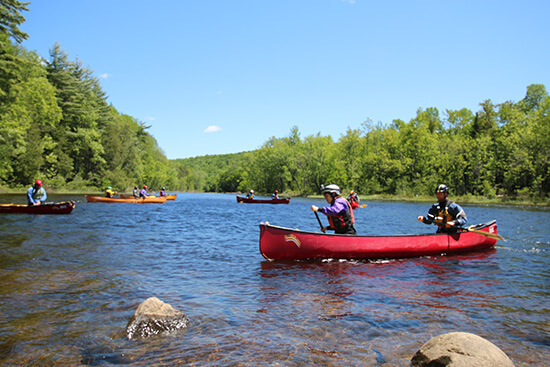 The lively city of Toronto is found on the shores of Lake Ontario; Lake Erie pours into Lake Ontario at Niagara Falls; and the calm waters of Lake Huron and Lake Superior offer canoeing, kayaking and hiking adventures. But for me it’s the more isolated lakes that are the most appealing. Dotted throughout the region, the little lakes of Muskoka, Algonquin and Killarney Provincial Parks are home to wildlife, water sports and some striking fall foliage colours. It’s not surprising that many Hollywood stars (think: Tom Hanks, Goldie Hawn, Kate Hudson) and affluent Torontonians own cottages here. If, like me, you’re an outdoorsy person, then Ontario is the place for you. With lakes, forests, mountains and rivers galore, the list of activities on offer in the state is endless. 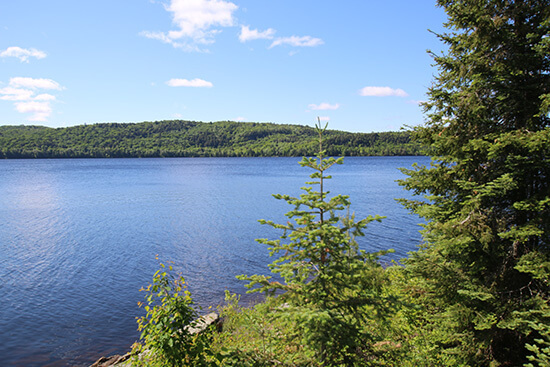 Try paddle boarding or pedaloing on Lake Rousseau, canoeing the rapids on the Madawaska River, swimming along the freshwater Wasaga Beach, skiing in the Blue Mountains, zip-lining over the forests or ice skating the frozen Rideau Canal. And after dark, look up to see the stars twinkle in the night sky. Driving north from Toronto, I was struck by the beauty of the Ontarian countryside. 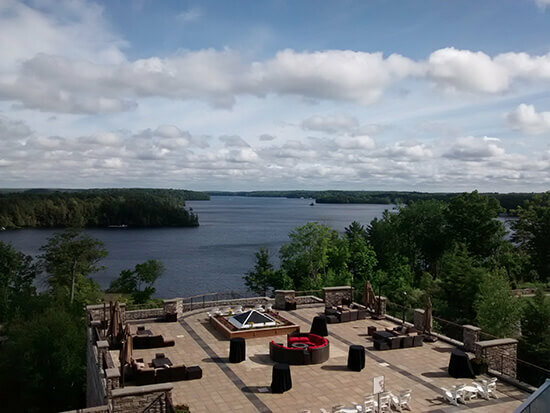 After passing through various small towns, their grid-like streets lined with porch-fronted wooden houses, decorative mail boxes and perfectly manicured lawns, we reached the lush and leafy Muskoka region. Lakes fringed by reeds and trees appeared, and we encountered a number of farms surrounded by fields of livestock and rolled up hay bales, not too far removed from the English countryside. 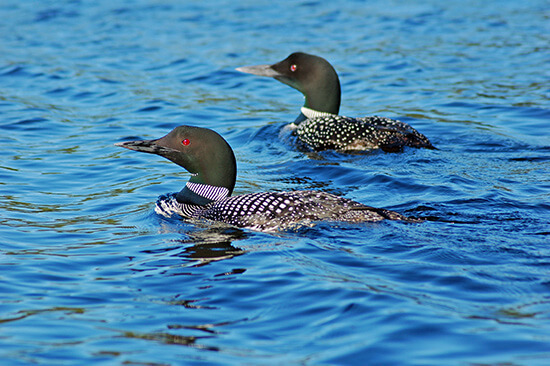 Ontario’s lakes attract wildlife by the bucket load. In just five days I spotted a rabbit, a chipmunk, two snakes, two moose, two deer, four hummingbirds, a red squirrel, a groundhog, numerous beavers, an otter, a muskrat and a large number of birds including the speckled black and white loon, pictured above. They weren’t too hard to find either (other than the moose) – most were spotted while canoeing on the lakes, driving the country roads or just cycling the forest pathways. Aside from the bustling streets of Toronto, I found the atmosphere in Ontario to be very laid back. The tranquil lakes and forests clearly go some way towards relaxing the mind, and the fresh air and good food worked wonders. To really kick back, I tried out the delights of the Scandinave Spa in the Blue Mountains, and spent a wonderful afternoon soaking in hot pools, lazing in hammocks under the maple trees and trying not to disturb curious rabbits. The Niagara region’s unique microclimate has made it a hotbed for wine production. Over 90 wineries can be found here, producing some award-winning vintages, including the famous Niagara Icewine, celebrated each year at the Niagara Icewine Festival. 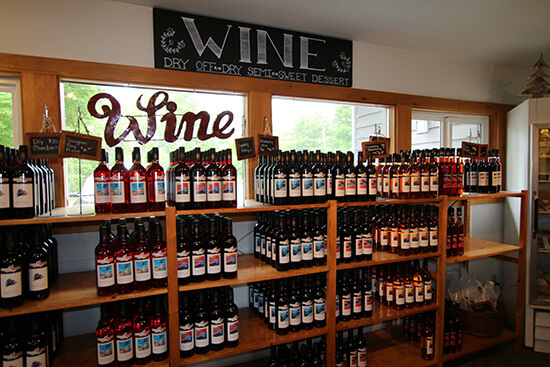 Quaint and villagey Niagara-on-the-Lake is a good place to start your wine-tasting exploits, and I can highly recommend Johnston’s Cranberry Marsh and Muskoka Lakes Winery, which produces some rich and sweet fruit wines from its home-grown cranberries. Ontario is justifiably excited about its Apple Pie Trail, a collection of apple-themed attractions along the shores of Georgian Bay. 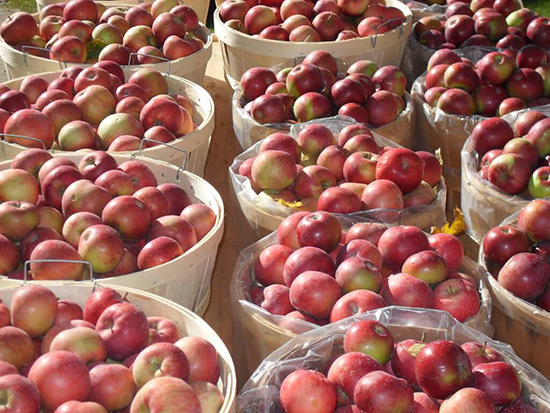 Conditions here on the Niagara Escarpment are perfect for growing sweet, juicy and crunchy apples, giving rise to the various craft cider breweries, apple markets, apple orchards, and apple cocktail bars that line the route. You can cycle, drive, hike or paddle between them, testing out the bakeries as you go and trying to decide which one offers the tastiest apple pie. It’s a close call. 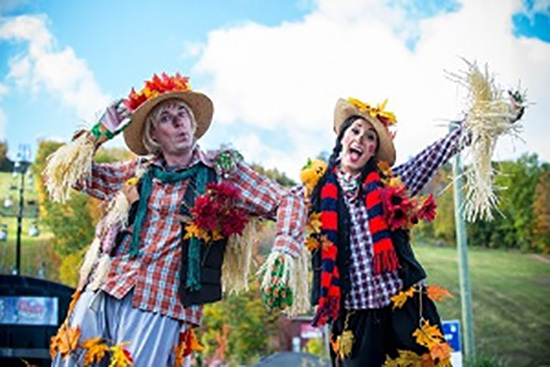 Ontario throws a number of rather eccentric festivals each year. 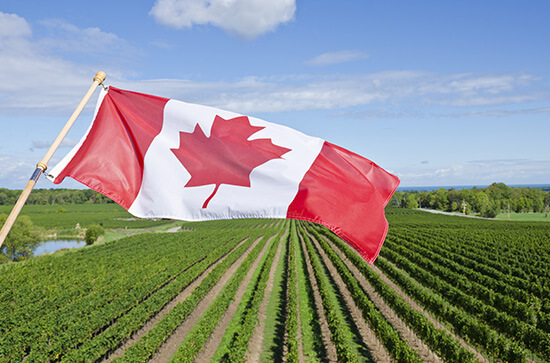 Many of them focus on fresh, locally grown produce, such as the annual Garlic Festival in Toronto, the Wild Leek and Maple Syrup Festival in Collingwood, the Bala Cranberry Festival on Lake Muskoka, and even more maple syrup festivals held across the state. Perhaps the quirkiest of all is the annual Collingwood Elvis Festival, held in late July, an enormous celebration that’s snowballed in popularity in recent years, featuring Elvis’ music, a tribute artist competition and a massive Elvis-themed street party. One of the main things that struck me about Ontarians is how proud they are to be Canadian. They were so excited to show off their country and tell me of its wonders. Canadian flags adorn buildings, cars and even bicycles, as the locals eagerly told us of the many foods we must try, the places we must go and the fascinating history of the region. Their enthusiasm was infectious, and lovely to witness. I was surprised at how easy it was to reach Ontario. I didn’t even need to fly overnight. I left London’s Heathrow Airport mid-afternoon and just over seven hours later was peering at the CN Tower from the arrivals hall of Toronto Pearson International Airport. It was only 5:40pm, still daylight, with plenty of time to clear customs, check into our hotel and go for dinner at a reasonable hour. I’m not going to lie, the tiredness did kick in a little later, but after a good night’s sleep I was ready to go and jet lag-free. 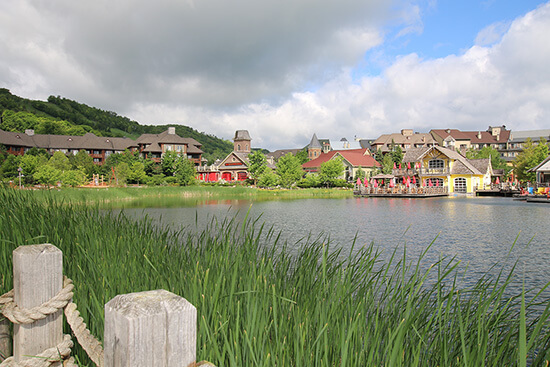 Explore the lakes and forests of Ontario with one of Flight Centre's Canada Journeys; give our Experts a call today for information and to book. Toronto, Vancouver, Montreal… What is the Best City to Visit in Canada?